THE IGLESIA NI CRISTO: Bible and Qur’an: What's the Difference? THE CHRISTIANS REGARD the Bible as their Sacred Scriptures, where the words of God are written. For true Christians, the Bible is the sole basis of their faith. Muslims also regard Qur’an as their Sacred Scriptures, where the words of God are written. So, what the differences between the two books? The Bible is a library (a collection) of sixty-six (66) books. Written in a span of 1,500 years (Genesis, the first book, was written about 1447-1407 BC, and Revelation, the last book, was written about 90-95 AD). The Bible is written by more than forty (40) inspired writers. Qur’an is a single book. It is comparable in length with the New Testament. The “standard Qur’an” was done by a single man. Take note that if you going to read the whole Bible, you can see that it seems it was written by a single writer in particular period or time because of its unity. Remarkable for the Bible is not a single book but a collection of 66 books, written by 40 men in a span of 1,500 years. If there is a unity in Qur’an, what’s remarkable about that for it was done by a single man in a particular time or period? The Christians firmly believe that the Bible is divinely inspired. The Muslims also claim that Qur’an is divinely inspired. “Divine inspiration” means that the one who wrote was truly inspired by God as prophet or apostle. The Bible is divinely inspired for the those who wrote the books are the inspired prophets and apostles themselves. The first five books (Genesis, Exodus, Leviticus, Numbers and Deuteronomy) are written by the inspired prophet Himself, Prophet Moses. The Book of Joshua was written by Joshua, The books of Samuel written by the prophets Nathan and Gad, the Book of Isaiah written by Isaiah, and so on. Remember that the “Qur’an” they were referring was not the “book” called Qur’an, but “Qur’an” that recited by Muhammad as “divine revelations” revealed to him. He seek out those “ur’an” and what he found were those in “leafless palm-branches, thin white stones and men’s breasts.” Divine revelation of God written in “leafless palm-branches and thin white stones”? Are these reliable and credible? Actually great numbers came from “men’s breasts” as we will see later. When Abu Bakr said to Zayd that “We do not doubt that you are a wise young man. You used to write down the revelation for the Prophet of Allah. So trace the Qur’an and compile it.” Zayd answered, “By Allah, if they had chosen me to move the mountain from its place, it would have been easier than compiling the Qur’an…How would you do something the Prophet of Allah did not do?” Take note that if Zayd have been written all or many of the “revelations” recited by Muhammad during the latter’s lifetime, he would not say such words, “if they had chosen me to move the mountain from its place, it would have been easier than compiling the Qur’an.” Zayd again said, “How would you do something the Prophet of Allah did not do?” This only proves that “Qur’an was not written and compiled during the lifetime of Muhammad.” The book called "Qur'an" does not exist during the lifetime of Muhammad. The Qur’an was put in writing after Muhammad’s death by a young man commissioned by Abu Bakr, named Zayd Ibn Thabit. Why did Abu Bakr commissioned Zayd to make the book that is now called Qur’an? During the Battle of Yamama many Muslims were killed. Abu Bakr said, “‘On the day of Yamama, Umar came to me and said that the reciters of the Qur’an were killed. He was afraid that others might be killed elsewhere. This indicates the loss of much of the Qur’an.” This proves (1) many “revelations” recited to them by Muhammad were not put in writing during his lifetime but only memorized by his followers, and (2) and not all recited by Muhammad were included in the book made by Zayd (thus refuting the alleged “perfect preservation" of Muhammad’s revelations or of Qur’an). Although the Lord Jesus Christ did not wrote any book in the Bible, however, the writers of the New Testament books were apostles and ministers of the Gospel, like Apostle John, Apostle Paul and Apostle Peter. Was Zayd Ibn Thabit “an apostle of Allah”? Apostle Paul said, “Now then, we are ambassadors for Christ, as though God were pleading through us: we implore you on Christ's behalf, be reconciled to God.” (II Corinthians 5:20, NKJV) Can Zayd Ibn Thabit say the same for Muhammad? Therefore, if the books of the Bible were written by the prophets and the apostles themselves, the Qur’an was not written by the prophet of Islam, not written by Muhammad himself, but only by a young man commissioned by Abu Bakr when Muhammad was already dead. So, the books of the Bible claimed “divine inspiration” because the writers of the book were the divine prophets and apostles themselves. How about Qur’an? How can it claim “divine inspiration” if it is not written by Muhammad himself but by a young man commissioned by Abu Bakr? Was Zayd himself an inspired prophet or apostle of Allah? 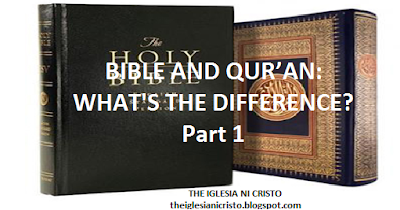 Truly, there are great differences between the Bible and Qur’an. The basis of the Bible’s divine inspiration is greater than the basis (if they have) of the Qur’an’s divine inspiration. There are still many great differences between the Qur’an and the Bible, but these are enough for now, and these are enough to show that the Bible rises over and above the Qur'an.